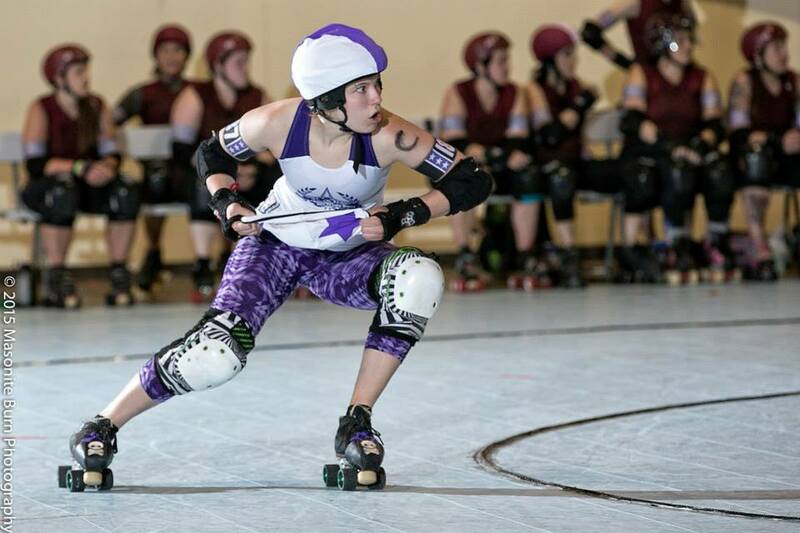 Slamlet wears many hats for the Brawlstars, in this case changing from pivot to jammer during a star pass at the Big O Tournament last year in Oregon. Photo by Masonite Burn. I couldn’t help but laugh at that. That kind of change is remarkable, but I can’t take credit for it. The credit belongs to the team—each individual who has dedicated their life to this team and to the endless pursuit of improvement. The truth is that what I have done has mostly been to facilitate. What does the team want? What does the team need? My job is to facilitate those things. I once conducted an interview for fiveonfive with the captains of some of WFTDA’s top teams: Bay Area, Texas, and London. I learned a lot from them about the ups and downs of captaining, but by far the most important notion that I walked away with that has stuck with me ever since was something that Brawllen Angel from Bay Area said: “Remember you are in a support role. Continuously improve. Raise your teammates up. Be what you want to see.” Brawllen Angel’s words have stayed close to my heart and have greatly influenced how I approach my job as captain. Captaining isn’t about spotlight or glory. Captaining isn’t about control or power. Captaining is about being what your team needs you to be. The Brawlstars, though a group of very different people, are united under the same goal—to play the best damn roller derby we can. Everything we do—and everything I do as a captain—is to reach that goal. We work hard at practice. We watch footage and analyze gameplay. We learn new skills and strategies. We take time to bond outside of practice. We cross-train. We work on our mental game. We push and encourage and help each other. Dedicated leadership can help move a team along, but the solidarity that comes along with a whole group charging toward a single goal is what makes a group a team. Add genuine love and respect and that team turns into a family. That’s where the Brawlstars are at, and it’s an incredible place to be. Now I don’t want to give the impression that captains don’t do important work. They definitely do, and it can be time consuming and stressful at times. Captains evaluate the strengths and weakness of each skater and the team and use their observations to determine how the team should train and what they should prioritize. Captains keep the team organized and focused. Captains make the tough decisions. But it’s important to remember that a captain doesn’t make a team and is not solely responsible for a team’s success (or failure, for that matter). Sure, I have brought my personal talents to the position. My open communication has helped to establish transparency and trust. My prioritization of collaboration has contributed to a sense of shared ownership of the team and its success. My obsession with rankings has led to a carefully designed season. But again, these are only tools I have used to fulfill my support role—to work for my team. Plus, at the end of the day, isn’t that what each team member is doing? They are bringing their personal talents to the team, building it up to be the best it can be. I just happen to have a title. And, of course, it would be difficult for a team to get to where we’ve gotten without the support of their league. Each person in our league of 100+ people has been part of our success by providing a foundation upon which we have built our team and its triumphs. And every time a league member travels to one of our away games to watch us play or posts on Facebook to say how proud they are of us, we melt a little. Their love and support are vital ingredients in our continuous journey onward and upward. Let the team run the team. You’re a captain, not a dictator. Yes, being a captain means making some tough executive decisions (like who gets rostered and who gets track time), but if you align your decisions with what the team wants, it is the closest you can realistically get to the team participating in every decision. At the beginning of each season, our captains send out an extensive survey that aims to gauge what the team wants. What’s more important: winning or equal playing time? Who should get more playing time: the people who consistently attend practice or the people of the highest skill level? Finding the trends within the team when it comes to these kinds of issues gives you a roadmap for the decisions you’ll need to make as a captain. And when in doubt about a certain decision, ask the team! Their input is valuable and will say a lot about how they want you to lead the team. Communication is just as important off the track as it is on the track. I have found in my years of captaining that open communication not only brings to light information important to your role, as touched on in the point above, but also leads to a kind of transparency that helps skaters to understand why decisions are being made in certain ways. Explain to your team how you make your rostering decisions. If a skater is unlikely to skate in a game or should expect to be the first one sat when the team runs into penalty trouble, let them know ahead of time. Always provide helpful feedback when possible so skaters know how they can move to the next level. I have found that most drama in derby stems from a lack of communication or an instance of misunderstanding. By being clear and honest with your team, you build mutual trust and understanding. Work toward a positive and productive team culture. Once you know what your team wants and what your team’s goals are, put policies and habits in place that reinforce those things. If your team wants to make it a priority to maintain a positive attitude on game day, you may need to sit that skater who lashes out at the refs on the track. If your team wants to make it a priority to have as much practice time together as possible, you may need to establish a policy that makes team practices a requirement for rostering. Once a team culture has been established, that team is more likely to become a self-regulating unit—those who are willing to operate in that same positive and hardworking culture will be drawn to the team and those who can’t put their own ego aside to be part of that culture end up weeding themselves out. But a team culture can’t be forced. The team needs to want to create it and be wiling to face the consequences that might be part of the process of getting there. Again, as a captain, it’s your job to facilitate that journey towards what your teammates have established they want. At the end of the day, the team comes first. Love your team. Value your teammates. And have fun! You are a part of something awesome. Posted on May 11, 2016 by Slamlet.